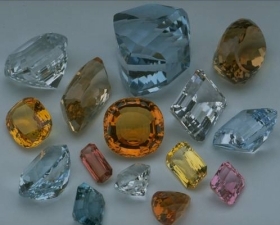 Topaz, according to the Bible, is the second stone God used to decorate Lucifer (Ezekiel 28:13). The name of the gemstone is derived, in the Old Testament, from the Hebrew pitdah (Strong's Concordance #H6357). Nine out of the ten Bible translations used in the series translate pitdah in this verse as topaz, while the NLT calls it "a pale green peridot." The second gemstone listed in the High Priest's breastplate (Exodus 28:17) also uses the word pitdah. In this Bible verse, however, it is likely referring to a peridot and not a topaz. Please see our section on the peridot stone for more information. The stone composing the ninth foundation in the New Jerusalem (Revelation 21:20) is referred in the Greek as topazion (Strong's #G5116). Both Strong's Bible Concordance and Thayer's lexicon translate the word as "topaz" but also state in might be our modern chrysolite. All ten of the Bibles used for comparison purposes in this series translate the word as "topaz." Topaz has been sought after and collected since ancient times for its stunning clearness and transparency. Wearing a topaz with the image of a falcon engraved on it was said to bring goodwill from kings and princes. It was also thought to stop the discharge of fluid from eyes that were diseased (Curious Lore of Precious Stones, pages 133, 312).